All of our sanitary and ASME BPE tubing is sourced domestically from reputable manufacturers with proven track records for quality. While it is no longer possible to source only domestic manufactured sanitary ASME BPE fittings, we do require that all of our sanitary tubular fittings are manufactured from sanitary grade, domestically manufactured Rath sanitary stainless steel tubing. We have learned over time that not all manufacturers have complete control over their internal materials management programs. Merely having a matching material test report does not completely insure that the material specified on your documentation is what you receive. To that end we have invested heavily in non-destructive alloy testing equipment to verify metallurgy. We have put in place statistical testing procedures to verify the metallurgy on our incoming sanitary BPE fittings and tube. 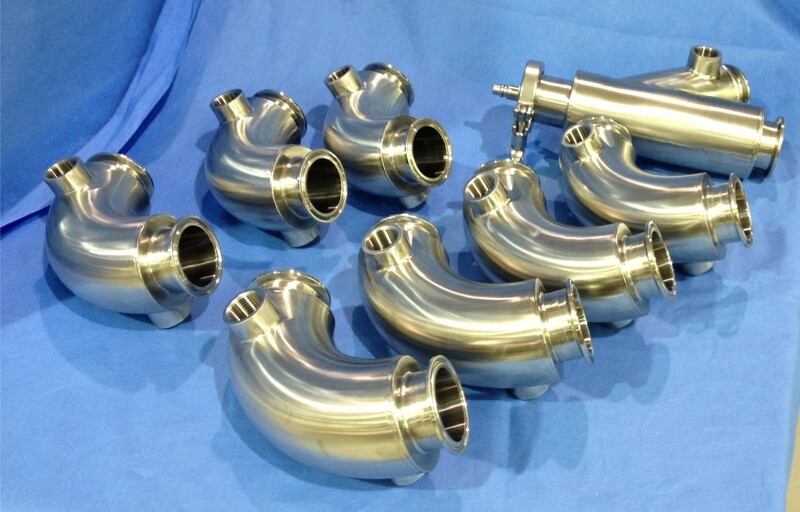 Large inventories of sanitary ASME BPE fittings and ASME BPE sanitary tubing as well as food grade sanitary fittings and tube and with a variety of end connections and surface finishes. We stock both buttweld and Tri-Clamp fittings in both 20Ra and 15RA with electropolish surface ID. Our sales staff is highly trained to make sure you get exactly what you want and get it in a timely manner. If we happen to be out of a part you are looking for, they have the knowledge to suggest viable substitutes. We source our ASME BPE sanitary fittings and tubing from well established, reputable manufacturers. Our primary source for sanitary and BPE fittings is Waukesha. Our primary source for ASME BPE and sanitary tubing is Rath Manufacturing. We have developed extensive procedures and an electronic data infrastructure to make sure that all of our sanitary fittings and tubing shipments are accompanied with the correct documentation. Our MTR’s are stored electronically. In the event that an MTR’s is lost at a job site, we have the ability to retrieve and e mail a new one in minutes. We have trained inspectors that can perform and document inbound inspection on BPE fittings and tubing, often eliminating the need to perform this function on the job site. This can eliminate the need to quarantine fittings when they are received at the job site. Custom Fittings: If what you are looking for is not an off the shelf part, we have a state of the art in-house stainless steel fabrication facility that can build made to order special sanitary fittings and piping assemblies.